The Oxai Aircraft M2 Skywave, a Shanghai-made two-seater amphibious light sport aircraft, successfully took off and landed on the Dishui Lake in Shanghai on its maiden test flight. The M2 Skywave, a two-seater amphibious light sport aircraft, flies over the Dishui Lake in Shanghai on its maiden test flight yesterday. The Oxai Aircraft M2 Skywave, a Shanghai-made two-seater amphibious light sport aircraft, successfully took off and landed on the Dishui Lake in Shanghai on its maiden test flight yesterday. 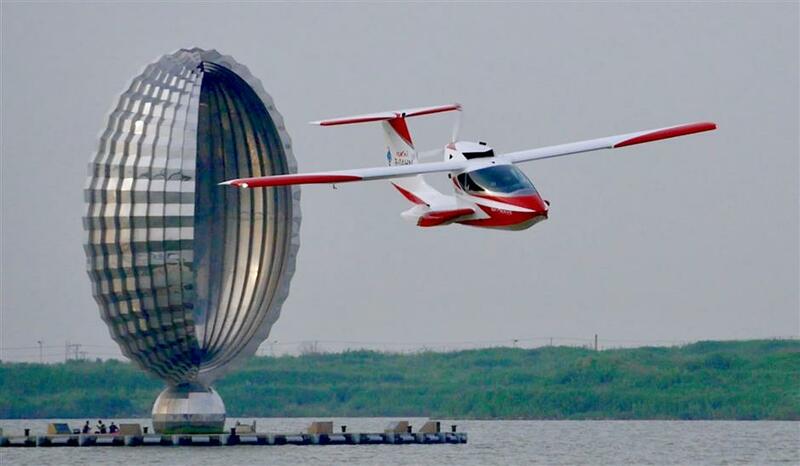 The single-piston aircraft, among the smallest of its kind in the world, carried out low-flying maneuvers around the lake at the southeast tip of the city. The M2 Skywave can fly up to 1,000 kilometers on 100 liters of fuel. The empty weight of the airframe, which is 90 percent carbon-fiber composite, is 350 kilograms and maximum takeoff weight is 650kg. Having an all-composite airframe, the M2 is powered by a 100-horsepower Rotax 912iS piston engine, which can run on autogas. Avionics are dual Garmin G3X Touch displays with a Garmin G5 attitude indicator as backup. Flight controls are conventional, with two control sticks in the cockpit. Roger Mao, Oxai’s chief designer, president and CEO, and his team have been working on the seaplane for nine years after receiving the type and production certificates from the Civil Aviation Administration of China. “Skywave performs well at low speed which is good news for junior pilots,” said Mao. The Skywave is designed to take off and land on both ground and water. “A distance of 200 meters is required for takeoff while the landing requires 150m on land and 250m on water,” Mao told Shanghai Daily. Oxai Aircraft, based in Lingang in the Pudong New Area, has already received 75 orders for the 1.8 million yuan (US$272,000) M2. It will receive Light-Sport Aircraft Airworthiness Certification from the Federal Aviation Administration when it is delivered to the American buyers. General aviation is emerging as a strategic industry in China after the State Council issued a guidance in 2016 to develop the industry. China plans to build more than 500 general aviation airports by 2020 to serve more than 5,000 aircraft. Skywave’s maiden voyage is a major breakthrough for China’s low-altitude airspace, according to the East China Regional Administration of the CAAC. Two field takeoff and landing points have been established in the Lingang area while two airspaces over the coastal town have been approved. Lingang has built a 600-meter grass runway and water takeoff-landing areas on Dishui Lake to enable test flights of drones and general aviation aircraft. The town is also a pilot zone of low-altitude digital management.